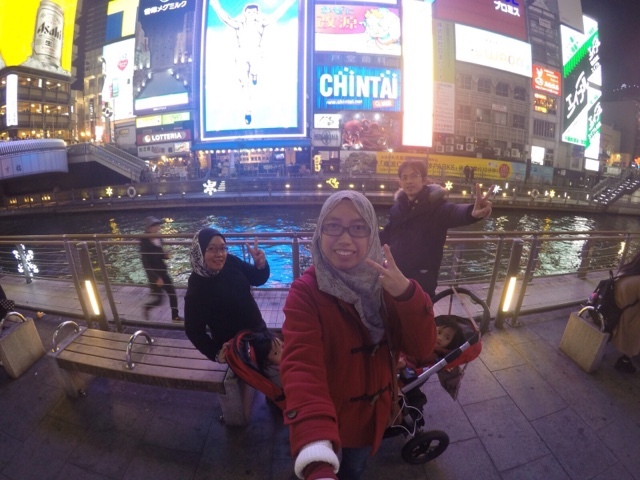 Finally, we are in Osaka - woot woottt! Everybody woke up late since we had a really tiring day the day before. By late, I mean 7.00am LOL. We had nasi ayam bento for breakfast then off we went to Kaiyukan! 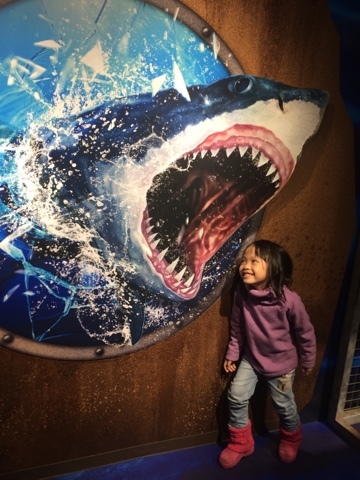 This is a MUST-GO place in Osaka if you have kids. All kids love watching fish and penguin and dolphin, 'nuff said. In Osaka, fish watching is taken to another level - in one of the biggest aquarium in the world. How cool is that? By the way, we didn't buy the Kaiyukan Pass because our Kansai Thru Pass also covers Kaiyukan area so it wasn't necessary to purchase the pass. It was cheaper to buy the admission ticket on its own. 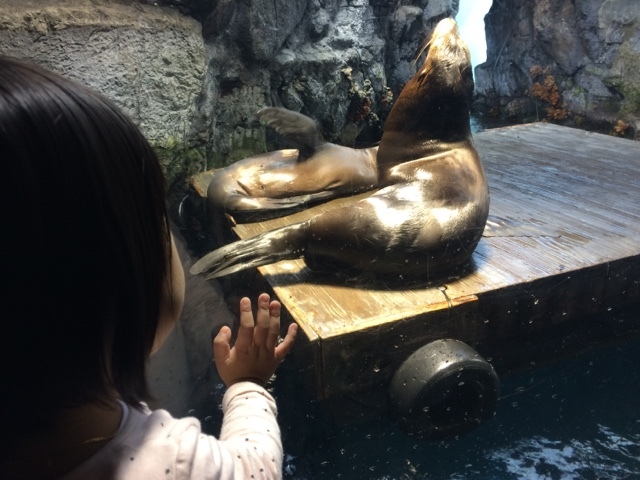 To get here, we boarded the train to Osakako station and then followed a clear direction to Tempozan Harbour Village, where this Aquarium is located. Other things of interest in this area is Tempozan Ferris Wheel and Legoland, but due to time (and budget) constraint, we didn't go to Legoland. 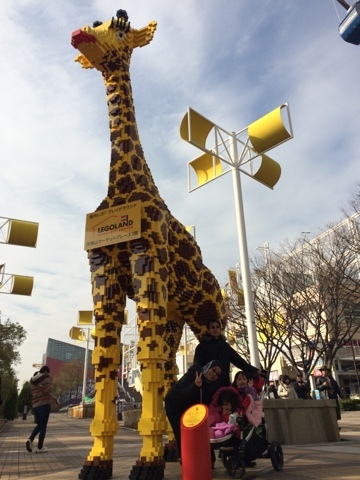 It's a really tall giraff made of lego bricks! Before we headed to Kaiyukan Aquarium, we decided to go on the Ferris wheel since it was still early and there was no queue to be seen (it was 10am, if you are thinking to skip the queue come around this hour). Oh, have I mentioned that it used to be the biggest and tallest Ferris wheel in the world before London Eye came along? Yup, checked this off our travel bucket list! 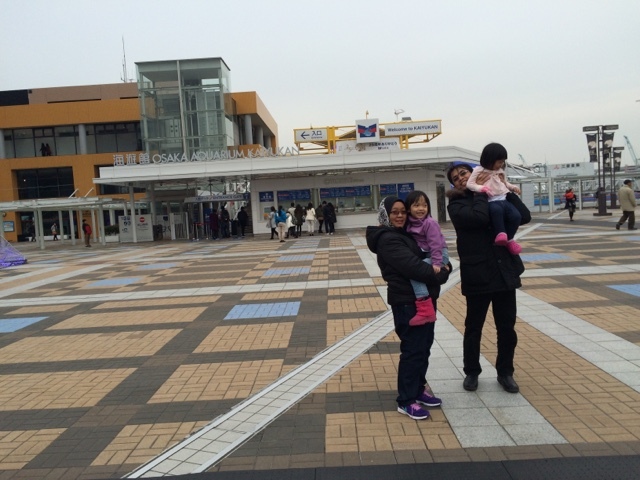 The fee was ¥800 per person but we got 10% discount which was out of the privileges of our Kansai Thru Pass. We were given the option of boarding the normal car or the see-through car, so of course we gotta try the see-through one! I admit the view was pretty impressive - we could see the sea, Mt. Rokko in the far distance and the whole Osaka city spread below us (and I was surprised to find that Osaka had quite bad haze but we didn't notice coz the air felt quite clean to me). At over 100m above ground level in a transparent car. Whee!!! 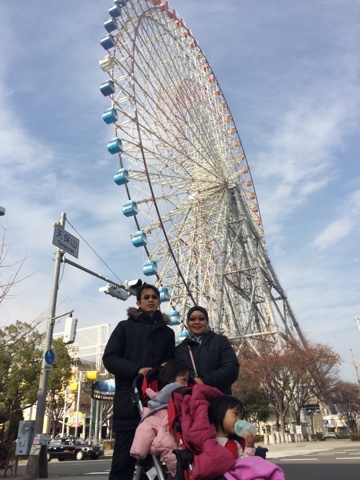 The Ferris wheel done, next we were off to Kaiyukan Aquarium. 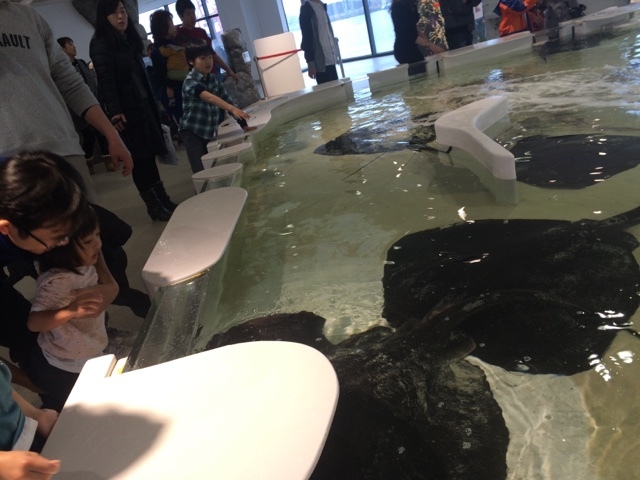 Entrance fee was ¥2300 per adult and ¥600 for preschool children (4-6 years old). Khadeeja got in for free because she's considered 3 years old. Although we could bring our stroller if we wanted to, we decided to leave it at the customer service counter (they have a dedicated stroller storage room) and explored the place on foot. 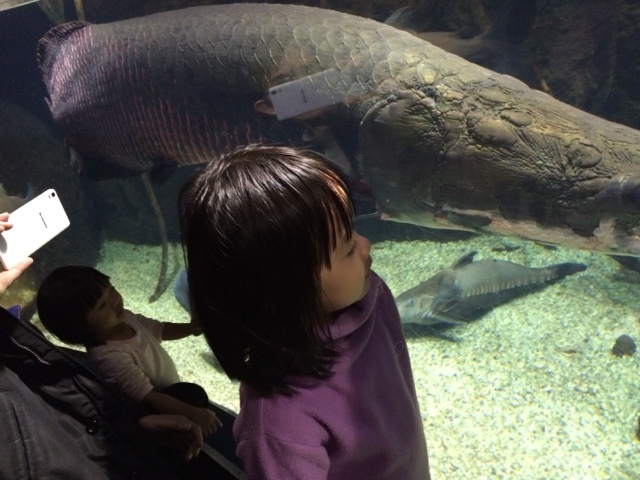 Immediately the girls got all psyched up and excitedly went about looking at all the fish and other aquatic animals. 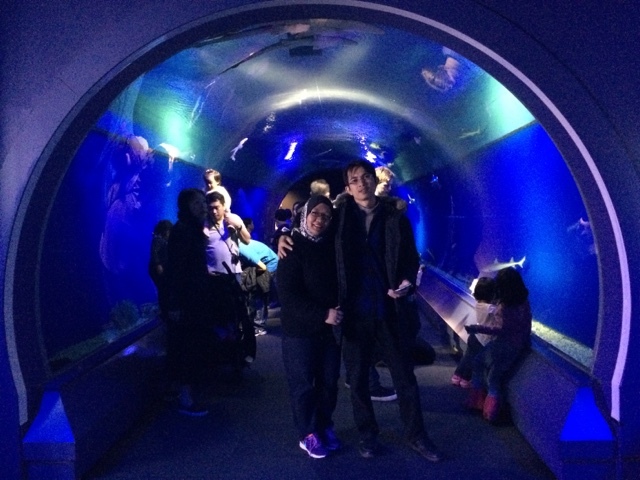 The aquarium was divided into several zones from all over the world such as Japan Forest, Pacific Ocean, South America, etc. All in all, there are about 30,000 creatures from hundreds of species in the aquarium. Look! Big fish passing by! 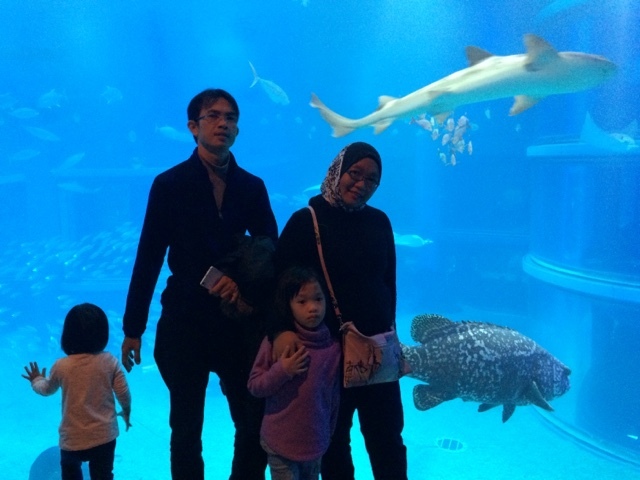 Our tour of the Kaiyukan Aquarium took about 4 hours, and by the time we finished it was almost evening so we quickly performed our solat outside of the building (at an open area but we picked a secluded spot with few passersby). We had late lunch / early dinner at a nearby Indian restaurant which costed us almost ¥60,000 (which made me think that anyone can open an Indian eatery in Japan regardless of whether they can cook authentic Indian cuisine or not). Next, we made a quick stop at Osaka Castle because well, it's Osaka's must-visit spot and it was in my bucket list of places to visit too. It took us longer time to reach here compared to actually being there because it was a long walk from the train station and we had to change train as well. Osaka Castle's construction started in the 15th century and was the largest castle at that time. It miraculously survived wars and air raids and underwent major repair works to preserve its glory and gave it a modern touch inside (where I read they even installed elevator inside the castle). 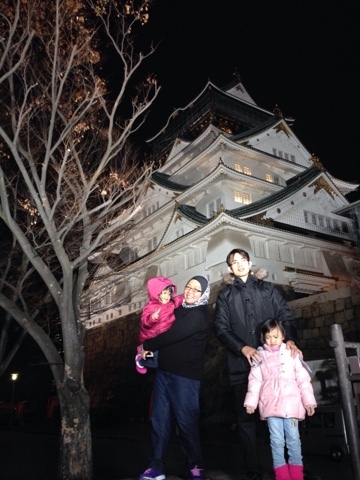 However we were only there to take a photo from the outside just as a proof that we covered the Osaka Castle - checked! The Junaidix clan was here! Remember my post that I wanted to go to Tenjinbashi-suji Shopping Street, the longest shopping street in Osaka? Come to think of it, I don't know why we didn't end up there and instead, ended up at Shinsaibashi. 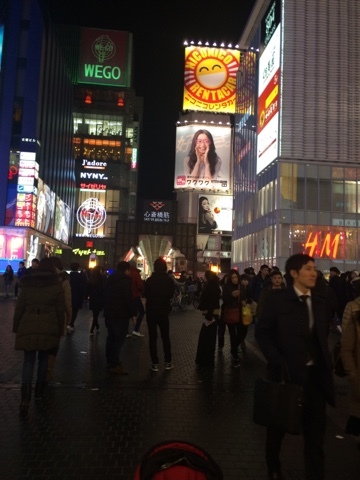 It wasn't totally a disappointing experience because I'm telling you - this is a MUST visit place if you want to experience the exciting bustle of a night life in Osaka! Basically, Osaka is divided into two major city centres - Minami (South) and Kita (North). We decided to forego Umeda Sky Building which is located at the Kita district to go to Osaka Castle, which is nearer to Namba, since we couldn't cover all places in one day. So in return, we got to spend a few hours exploring Osaka's most famous entertainment district. The crowd here was understandably humongous and we had to be careful pushing our strollers to avoid running into other people. But we really ENJOYED feasting our eyes here! 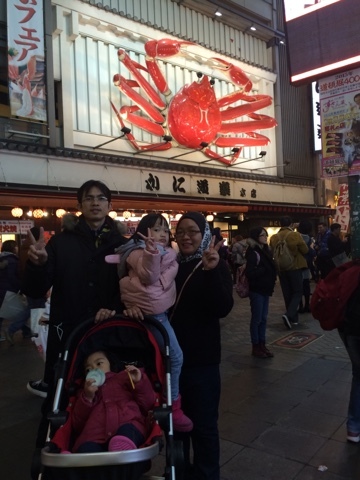 Khayla & Khadeeja was awe-struck to see a mechanised giant crab adorning a crab restaurant, which is one of the famous landmark in Dotonbori. Sadly, we didn't get to try the giant crabs because they were SUPER EXPENSIVE! (we were running out of cash by now). Ambik gambar giant crab pun jadilah. Kani Doraku Giant Crab that actually moves! We strolled along the long streets until we reached Ebisubashi Bridge (local people nicknamed the bridge as the 'pick up' bridge because this is where young men always pick up young girls!) 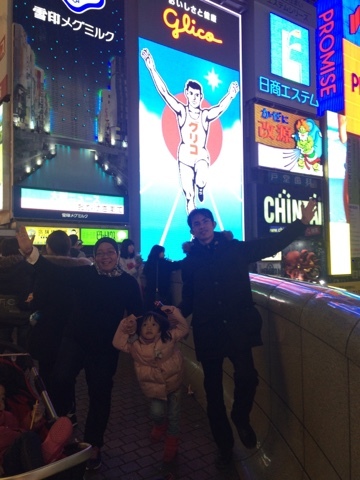 overlooking the Dotonbori canal, to snap another photo of a famous landmark in Dotonbori - the Glico Man. The giant neon billboard of an athlete running on a blue track was installed in 1935 and was originally a symbol of Glico candy. Somehow along the way it became a symbol of bigger things such as the World Cup and baseball sports team the Hanshin Tigers not to mention, a famous landmark for Dotonbori area! 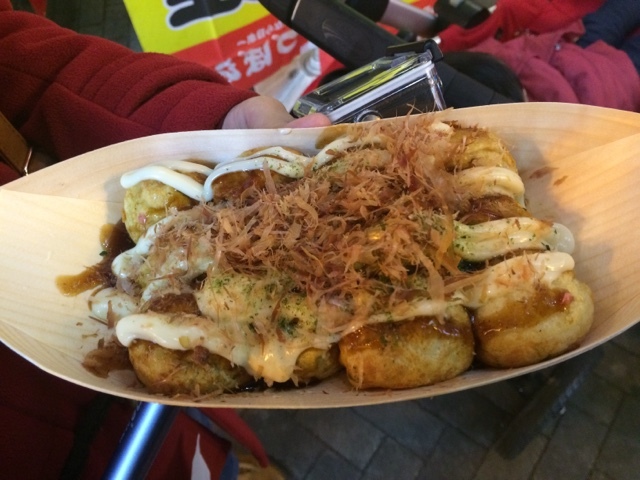 My sister recommended us to try a popular snack in Dotonbori - takoyaki (octopus dumpling). True enough, there's a long queue of people wanting to buy takoyaki but it was worth it. The piping hot dumpling tastes heavenly especially when you eat outside in the cold weather! I really like the seafood (dried fish?) shavings on the dumplings because not only it's delicious, it was also fun to watch the shavings shrivelling up on the hot food as if it was something alive. Takoyaki experience ended our adventure for the day and it was time for us to go back to our place because the next day, we are going to Universal Studios Japan (USJ)!